Unsanity.com has updated WindowShade X to 5.0.6, grab it here: http://www.unsanity.com/haxies/wsx, and I thought this would be a good time to give a mini-review. 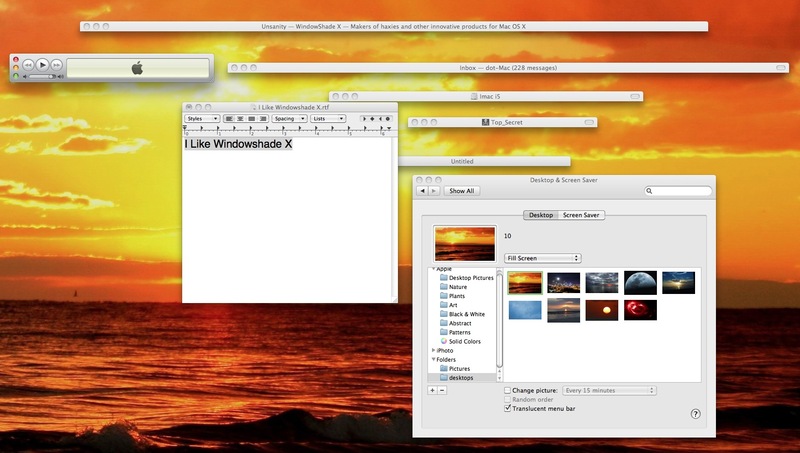 WindowShade X is a simple system utility app. which if my memory serves me correct was a feature introduced by Apple way back in Classic Mac OS 7 or 8 where you could collapse windows to their titlebar. Essentially when you double-click on the title bar of a window, instead of the window moving into the dock, which you can leave that feature on if you like, it will collapse the window to the title bar in its place. I love this feature as it seems to increase my productivity when I have my desktop infested with a copious amounts of windows to deal with dragging and dropping files from one window to the next. WindowShade X has many other features like making the window transparent which can be dialed in to your exact liking among others. Sidenote: Some people have said the Application Enhancer, aka APE, WindowShade uses tends to cause issues with their system. Personally I have used Windowshade close to a decade since Mac OS 10.1 on dozens of Mac systems with various flavors of Mac OS X from web production to gaming systems and haven’t had any issues related to APE or WindowShade. I’m currently using WindowShade X 5.0.6 on a iMac i5 using Snow Leopard 10.6.4. Personally I find WindowShade X a utility application I would hate to be without.